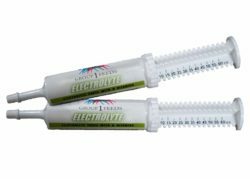 B Vitamins for Post-Race Recovery Electrolyte B is an electrolyte paste containing 11 different vitamins and 6 key minerals. This paste is specifically designed for performance and recovery. Electrolyte B is formulated to replace key nutrients lost through sweating during strenuous exercise or travelling. Give 30ml per 500kg body weight after moderate exercise or travel.